Egypt's interim government is predicting economic growth of 4 to 4.5 per cent in the fiscal year that begins in July, a minister said on Monday. The figure is significantly above estimates from economists polled by Reuters, who predict growth of just 1.6 per cent for 2012/13. Last week, the government submitted a draft budget for 2012/2013 that includes a 15 per cent increase in spending. "The government aims to increase the growth rate to 4 to 4.5 per cent, which is a bold rate given the current circumstances, by making larger investments," Fayza Abul-Naga, the Minister for International Cooperation, told reporters. 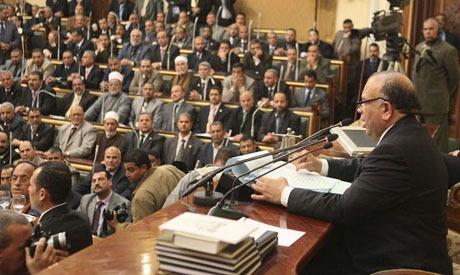 Finance Minister Momtaz El-Saeed said spending in the budget would be LE537.7 billion, adding that the deficit would be about LE140 billion. His numbers differed from a previous spending figure, quoted in the state-run Al-Ahram newspaper last week, of LE516 billion with a deficit of LE170 billion. Saeed said revenue from taxes and tariffs would boost the state's income to LE392.4 billion pounds next year from LE349.6 billion this year. Government investment will increase by 10.3 per cent in the coming year, he added. The budget is currently awaiting approval from the country's army rulers and elected parliament. The government of military -appointed Prime Minister Kamal El-Ganzouri is expected to resign by early July after the election of a new president. When it announced the 2011/12 budget in June last year, the government had put spending at LE490.6 billion, up 14.7 per cent from the previous year. In March, the finance minister put the deficit for the current year at LE144 billion. Many economists believe the wave of political and economic turmoil since last year's uprising, which ate into revenue and increased demands for higher wages, could end up pushing the actual deficit much higher. A survey of 11 economists in March forecast that year-on-year gross domestic product (GDP) will grow by 1.6 per cent in the financial year starting on 1 July, but will rise to 4.0 per cent the following year.